Should Pitchers Throw a Football? I get this question a lot. 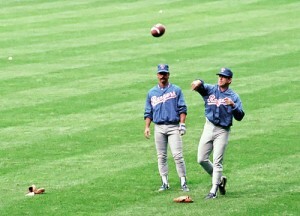 More than likely this picture of Nolan Ryan throwing a football will answer the question for most people. The problem is just because a pro is doing it, doesn’t make it right. For example, there are a lot of pro’s who recommend baking a new glove in the oven to help break it in, but the glove companies are totally against this. So who do you believe? I would believe the glove companies because they actually study the science of glove making. Just like I would listen to a well educated experienced coach before a professional ball player. This is because most good coaches study the mechanics of all ball players and a pro player only studies the mechanics of themselves. Throwing a football is slightly different than throwing a baseball because of the weight. You tend to release the ball more out front and standing up, but it forces you to completely pronate your arm at release because this will create the spiral. If you were forced to pronate your arm when throwing a baseball you would see a lot less elbow injuries in the game. I believe Tommy John surgeries, which is the tear of the UCL, would not exist if we threw baseballs like footballs. This is why UCL tears rarely happen in football. You mainly have rotator cuff issues. This is why I recommend that my pitchers throw footballs. I just make sure that they throw the footballs in certain positions that makes them throw the ball with good external rotation and forward trunk tilt. In these positions the football is also a good training tool because it will tell you if you are getting early internal rotation after external rotation. This is because to pronate your arm at release, your arm must be internally rotated. These are all components of high velocity pitchers. I recommend that when throwing a football for baseball training you use a smaller football than a professional size one. This is because it is important that you have a good grip on the ball, so you can achieve some good pronation. For a great pitching program full of drills, exercises, lifts and more, checkout the 3X Pitching Velocity Program which will add 5-10mph to your fastball in 16 weeks. It will teach you what it takes to throw hard. I love throwing a football to warm up. Great article! Pitching Drills All rights reserved. Powered by New Orleans SEO.